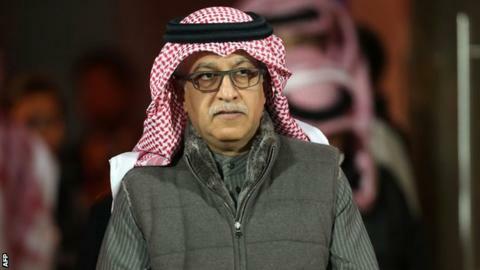 Bahrain's Sheikh Salman bin Ebrahim al-Khalifa has been backed to become the new Fifa president by the Confederation of African Football (CAF). Sheikh Salman, the Asian Football Confederation president, is one of five candidates in the 26 February election. After failing to receive the support of his own confederation, South African Tokyo Sexwale has been advised to "discontinue his campaign". Meanwhile, the Spanish Football Federation has backed Gianni Infantino. France's former Fifa deputy general secretary Jerome Champagne, Switzerland's Uefa general secretary Infantino, Sheikh Salman and Sexwale made presentations to CAF at a meeting in Rwanda on Friday, but the final candidate Prince Ali Bin Hussein of Jordan was not present. South Africa's Tokyo Sexwale says he still intends to stand in the Fifa elections. Africa's football governing body has 54 full voting members in the poll to replace outgoing Fifa president Sepp Blatter, although their support does not necessarily translate into a united block of votes in the secret ballot. CAF's decision is a blow to Sexwale and BBC Sport has been told by a senior South African Football Association official that the 62-year-old should end his campaign. But Sexwale said: "The election goes ahead and I am a candidate. I have been sent by my own association in South Africa and I have presented the aspirations of many associations across the world who have nominated me." Sheikh Salman already has the backing of the Asian confederation, while Infantino is supported by the European body along with the 10-member South American confederation, CONMEBOL. Sheikh Salman said: "The two endorsements only mean that there is a strong groundswell in favour of my candidacy. What they don't mean, is that I can sit back and relax. "Naturally, I am confident that I now have a reasonably strong position to work from with such support." This is undoubtedly a major boost to Sheikh Salman's hopes of winning the Fifa presidential election. As the head of the Asian Football Confederation he's guaranteed to get the bulk of support from his own continent. With his main rival, Uefa's Gianni Infantino, assured of support from Europe this election will come down to who can gain the most votes from the two "swing states" - the football associations of Africa and the Caribbean. Gaining CAF's support doesn't mean Salman is now assured of receiving all 54 votes from the continent. Previous elections have shown that's not always the case and there will be no bloc vote on this occasion either. Additionally, it's a secret ballot so voters are free to defy their regional leaders if they so choose. But what this decision does show is that Salman has the backing of a major Fifa powerbroker, Issa Hayatou, along with other senior African football officials. History shows that such support is often a key predictor in identifying the eventual victor. Infantino's race is far from over though. And the Uefa secretary general definitely has momentum right now. He has, so far, received the public backing of 41 national associations - 11 from outside Europe. Any talk of a deal or an electoral pact between him and Salman now appears very wide of the mark. Meanwhile, Prince Ali of Jordan could yet play a pivotal role in the final outcome - but that will depend on how many votes he can secure on 26 February. Jerome Champagne will fight to the bitter end and so too will Tokyo Sexwale. However, he must do so without the CAF and, perhaps, the support of his home FA. Who is Fifa candidate Sheikh Salman? Read more on Fifa: Who is presidential candidate Sheikh Salman?